Russia is paying a hefty price for supporting the break up of Ukraine -- $106 billion, to be precise. Russian Prime Minister Dmitry Medvedev gave the first official estimate of the cost in a speech Tuesday. He said the decision to annex Crimea had sparked a crisis that turned out to be "more difficult" than even the most pessimistic expectations. Western sanctions imposed over Crimea and Moscow's support for separatist rebels in eastern Ukraine had cost Russia $26.7 billion in 2014. This year, the costs could balloon to $80 billion, he said. "There should be no illusions. Today we are faced not only with a short term crisis," Medvedev said. The latest trade statistics show just how bad the situation has become. The value of Russia's foreign trade slumped 30% in the first two months of this year. Russia's trade with its biggest partner, the European Union, fell by more than a third. Moscow retaliated against European and U.S. sanctions by banning most Western food imports. Overall, food imports fell 40% in January and February. But the move has backfired, pushing inflation up to nearly 17% in March -- the highest rate in 13 years. Related: Is now the time to buy Russia? Western sanctions left Russia even more vulnerable to last year's 50% plunge in oil prices. Russia relies on oil and gas exports for roughly half of its government revenue. The value of its energy exports dropped by 40% in the first two months of 2015, and the government has already been forced to slash spending. "Clearly, the economic consequences of the Crimea decision would be easier if our economy had not accumulated a number of internal problems, which we were not able to resolve in time," Medvedev said. To counter soaring inflation, Russian interest rates have shot up to painful levels. And Russia's GDP is expected to shrink by as much as 5% in 2015. 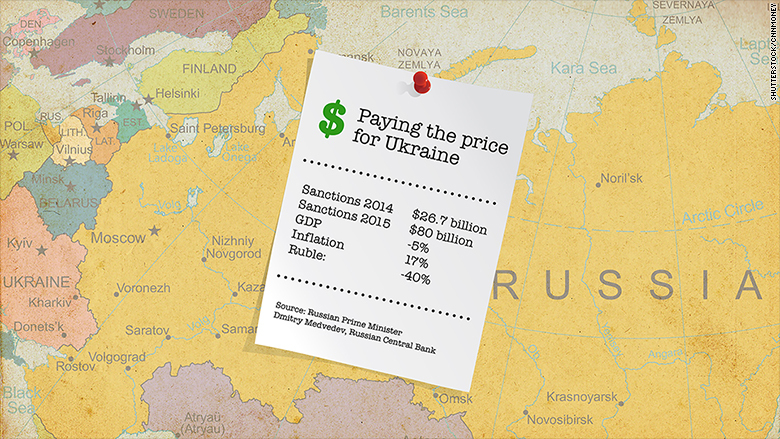 President Vladimir Putin has tried to shrug off the the impact of Western sanctions. He has promised to find trading partners elsewhere -- particularly in Asia -- and forecast earlier this month that the Russian economy will be growing again in 2017. But that's looking like wishful thinking. The only major trading partner to do more business with Russia so far this year is Japan. -- CNN's Emma Burrows in Moscow contributed to this report.